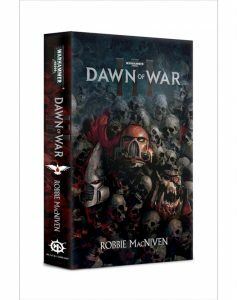 Scottish author Robbie MacNiven is one of the rising stars of Games Workshop’s publishing arm, the Black Library, gradually making a name for himself over the last few years as a great writer of Warhammer 40k and Age of Sigmar fiction. 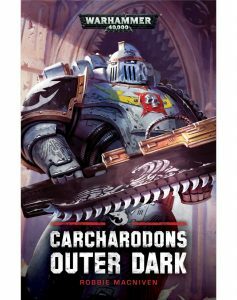 Geekzine editor Andy Jamieson cited Robbie’s excellent space marine novel, Carcharodons: Red Tithe in his best books of last year. A sequel, Carcharodons: Outer Dark is released in hardback March this year. Robbie took time out of his hectic schedule to tackle a Geekzine interview. 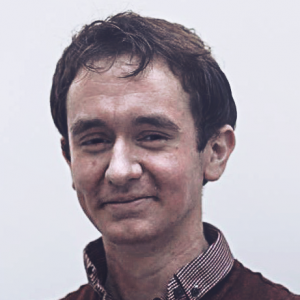 Andy Jamieson: Your new Space Marine novel, Outer Dark, is released very soon. What can you reveal about it? Robbie’s new novel, Carcharodons: Outer Dark, released March 24th. AJ: The Carcharodons space marines are quite a niche chapter in Warhammer 40k – how did Red Tithe come about? Was it something you pitched to BL or vice versa? RM: I’d always been intrigued by what little lore there was on them, so when I first started writing for Black Library I asked if there was any chance I could try and expand on it with a novel and some short stories. They were a little reticent at first (understandably – brand new author plus niche Space Marine Chapter isn’t necessarily a great combo), but they could tell I was hyped to give them a go, so they green-lit it. I sure am grateful they did! AJ: With a second Carcharodons book due out, do you have further plans for them beyond that? RM: Definitely, we’ll have to see how Outer Dark goes first, but I’d love to do a third book, and have plenty of ideas to take them further! 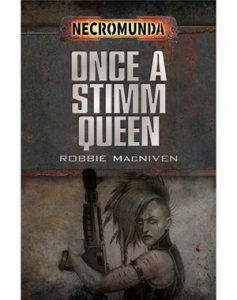 AJ: You also have a Necromunda short story out now, called Once a Stimm Queen. What can you share about that, and have you been playing Necromunda Underhive for research? RM: Not much beyond the fact that it involves Eschers, Goliaths, and an Enforcer sting gone horribly wrong. I’ve always been fascinated by the Necromunda setting, so I was really glad when they asked me if I wanted to write for it. Sadly I’ve been too busy to give the tabletop game a shot, but I’m hoping to find the time for it at some point, and I can’t wait for the Enforcers to get a new release! Robbie’s new Necromunda short story, available as an eShort. RM: I wish! As I said, with the amount of writing I’m doing at the moment (a novel, another novel’s edits, a novella’s edits, three short stories and a University PhD…) I’ve not had time to dedicate to The Hobby for a while. That being said, I’m desperate to start a Maggotkin army for Age of Sigmar (I’m a long-time Chaos player in Fantasy). AJ: Aside from your work for the Black Library, what other plans do you have? RM: At some point I’m hoping to pursue my own sci-fi setting with a major publisher. I’ve also got an urban fantasy novel about werewolves (it’s grim and gritty, I promise) that I’m going to get around to touting eventually! AJ: What’s been the highlight of your writing career so far? Discovering that I’d been hired by Black Library. Writing my first 40k short story (Deathwatch 4: Redblade). Getting to write parts of a story from the perspective of Ragnar Blackmane (in Legacy of Russ). Being approached for representation by my current literary agent. Being asked to write the novelisation of Dawn of War 3. AJ: What was the last good book that you read? RM: Warmaster by Dan Abnett. I was worried it might be hard to get into given it’d been years since I last read a book in the Gaunt’s Ghosts series. I needn’t have worried. I was like old times all over again, Dan delivers on every level, and then some. AJ: What is the best writing advice you’ve been given? And what advice do you give out to other writers just starting out? RM: The best advice I’ve been given is the same advice I’d give out – you’ve got to keep reading, and keep writing. It sounds basic, but it’s true. The only way to succeed at writing is to hone your craft and keep getting up after rejections knock you down. It took me a full decade of trying before Black Library took me onboard. The only thing limiting you is how much time you’re able and willing to dedicate. Thank you to Robbie for his excellent answers. You can follow him on twitter @RobbieMacNiven, and check out his blog too.